Note: This story was originally published in December 2016. Read the latest updates on this legislation. We’ve handled many distracted driving cases, with each one just as frustrating as the last. Usually the culprit is a driver using their cell phone, texting, checking social media, or even a drunk driver not paying attention to the task at hand. These instances have resulted in serious injuries and death for loved ones in the Oregon area, but hope may come in the form of a senate bill. Oregon Senate President Peter Courtney is leading an effort to increase the penalties of people convicted of distracted driving. With help from various state officials and Oregon law enforcement officers, Courtney’s proposal would make the penalties for distracted driving the same as a DUI. A first time offense would carry a maximum penalty of one year in prison, a $6,250 fine or both. Multiple violations over ten years would increase the penalty to five years in prison and a $125,000 fine. 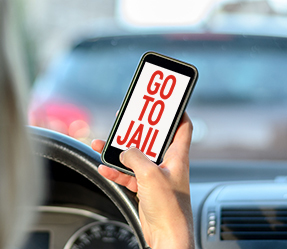 Under current Oregon laws, driving while texting or talking on a phone is a Class C traffic violation accompanied by a max fine of $500. Courtney started pushing for harsher penalties after he noticed the rising trend of fatal crashes in Oregon, many that were blamed on distracted driving. Moving forward, the revised bill would be introduced for testimony and approval in early 2017. Courtney hopes the process moves swiftly so that no more lives are lost on Oregon roads from distracted drivers.